Design your own handbag and strut your stuff in style. The zip top handbag is personalized with your own photos or design for a striking fashion statement. With a designer look and feel, our custom photo handbags have Italian leather handles and three internal pockets for easy organisation. All that’s missing is the kitchen sink. Versatile and secure, your personalized handbag with zip top opening is the stylish but safe option when going shopping or out of town. The width at 19" makes this custom handbag extremely spacious, ideal for groceries, gym clothes or just loads of girly stuff. Made from Monroe satin, or a choice of either smooth or textured 100% real Italian nappa leather, your personalized handbag has fluidity as well as structure. 5 chrome based stud ‘feet’ are pressed onto the base to protect the bottom of your unique handbag from touching the ground. The bag is nice and the website was easy to use. Great quality, fast turnaround. I wish there was information about company location on their website. Had no idea company is in UK. The site was easy to navigate and design the handbag layout. I purchased the bag for mother's day and it was a hit. Although it was a little bigger than expected, the printing and quality was above my expectations. I would recommend the zip top hand bag to anyone. What Will My Zip Top Handbag Look Like Personalized? When printed onto the Monroe satin, your photos are bright, vivid and highly detailed. Your image will look just like a proper photograph! The tapered shape allows for a larger opening area, and the structured base adds extra support and helps keep the bag from losing shape. The 100% genuine leather twin handles are sewn onto the front and back to make carrying your custom photo handbag extra comfortable. The leather option comes with a high-quality Italian silver zip and a long leather puller. If you opt for the satin option your zip-top handbag will have a high quality plastic zip with a short leather puller. The printing method we use makes your large zip top tote bag design as strong as the leather that it is printed on. We use beautiful Italian Nappa goat leather to make your personalized leather bags, and as with all high-end leather products, the print can lift if you scuff the leather. This is most apparent in corners and along the bottom, and we advise that you take extra care with your personalized zip-top handbag to keep it looking as good as new. Like many of our products, the personalized zip top handbag comes with a quantity discount, so buy more than one today and save money. We chemically bond the colored ink to the fabric to ensure the print won’t fade or rub away after use, making this personalized handbag for women a great bespoke gift. Making each handbag custom and to order ensures you have an original designer handbag just for you. Our fabric is hand cut and hand sewn by expert textile professionals to achieve excellence every time. These designer inspired handbags are perfect for moms who find themselves shopping unexpectedly, or need a large shoulder bag for work. Personalized with a custom photo, handbags like this can’t be found in ordinary shops so as a birthday or Mother’s Day gift they’re perfect. For shopaholic sisters, personalized handbags with a zip top opening is the ultimate partner for a little retail therapy. 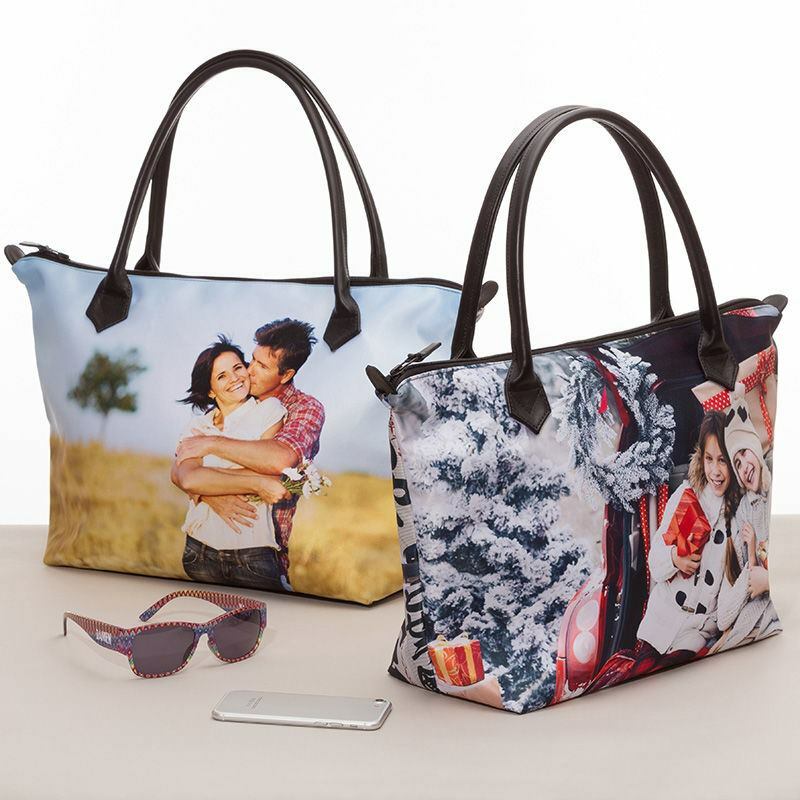 This bespoke handbag printed with your photos gives you security as well as style. What more could you want? Our zip top handbags feature rolled leather handles that are sewn onto the front and back to ensure your bag is robust. When choosing your photo or design, be mindful to keep key features away from the handle areas to achieve your perfect print. Monroe satin has a very long lifespan, so choose a timeless design when customizing unique shoulder handbags. Design your very own photo clutch bag! Upload a design for the front, back, and inside of this chic fabric clutch bag.